DiTerlizzi, T., & Black, H. (2005). Arthur Spiderwick's field guide to the fantastical world around you. New York: Simon & Schuster Books for Young Readers. When one first opens the pages of Arthur Spiderwick's Field Guide to the Fantastical World Around You, John James Audubon's wildlife paintings of North American birds immediatley comes to mind. The details of these pencil over gouache prints bring a rich and tangible beauty to the fantastical creatures in this "field journal." DiTerlizzi and his wife Holly Black designed this book to appear to be an actual journal belonging to Arthur Spiderwick (of The Spiderwick Chronicles) complete with hand written notes, sketches and the final colored prints. The creatures found in these pages and the accompanying text allow the reader to become immersed in a fictionalized "non-fiction" account of trolls, brownies, griffins, mermaids and many other denizens of the fantasy world. Arthur's field guide is remiscent of the wildly popular Gnomes by Wil Hugeyn and Rein Poortvliet (1977) with its observations and studies of the "wildlife" surrounding us. As a secret glimpse into the fantasy world, Arthur Spiderwick's Field Guide is sure to delight fantasy fiction readers. While it is valuable to have read the Spiderwick Chronicles, it isn't mandatory to enjoy this lovely book. An appreciation for art combined with a love of fantasy make Arthur Spiderwick's Field Guide a great read and connection to many myths and legends that students will cover in texts ranging from the Arthurian Tales to Shakespeare to the Odyssey. 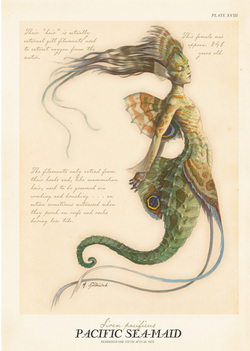 So many texts contain allusions to mythic creatures that DiTerlizzi's work could be a nice addition to any home or classroom library. Be sure to visit the link on the Illustrator Studies home page to see more of Arthur Spiderwick's Field Guide to the Fantastical World Around You.